(About) Confederate General Robert E. Lee poses in April 1865 in this photograph by Mathew Brady in Richmond, Virginia. Just seven days before this portrait was taken, General Lee surrendered the Army of Northern Virginia to Union General Ulysses S. Grant at Appomattox Court House (April 9, 1865). Lee's surrender had marked the "beginning of the end" of the Confederacy and the American Civil War. National Archives. Lee, Robert Edward, born on January 19, 1807, in Westmoreland County, Virginia; appointed from Virginia as a cadet in United States Military Academy (West Point), July 1st, 1825; graduated second in a class of forty-six; distinguished graduate with honor of never receiving a single demerit – a feat which has never been matched or duplicated. - Brevet second lieutenant, and second lieutenant of engineers, July 1st, 1829. - First lieutenant, September 21, 1836. - Captain, July 7th, 1838. - Brevet major, April 18th, 1847, for gallant and meritorious conduct at the battle of Cerro Gordo, Mexico. - Brevet Lieutenant colonel, August 20th, 1847, for gallant and meritorious services in the battles of Contreras and Churubusco, Mexico. - Brevet Colonel, September 15th, 1847, for gallant and meritorious conduct in the battle of Chapultepec, Mexico. - Lieutenant colonel, Second Cavalry, March 3rd, 1855. - Colonel, First Cavalry, March 16th, 1861. - Major general commanding Virginia State forces, April 23, 1861, and charged with organization of State forces. - Brigadier general, C.S.A., May 14, 1861. - General, C.S.A., June 14, 1861. - General-in-chief, January 31, 1865. - In command of operations in the Trans-Alleghany region of Virginia, in the autumn of 1861. - November 5, 1861, in charge of the defenses on the coast of South Carolina, Georgia and Florida. - Commanding the Army of Northern Virginia, June 2, 1862. - March 13, 1862, assigned to duty at Richmond, and charged with the conduct of all military operations of the Confederate States Army, under the direction of the President. - In command of the Army of Northern Virginia, from June 1, 1862, to the surrender of his army at Appomattox Court-House, Virginia, to General U.S. Grant, U.S. Army, on the 9th of April, 1865. - February 6, 1865, assigned command of all the armies of the Confederate States. Died at Lexington, Virginia, October 12, 1870. Benjamin Harvey Hill of Georgia, referring to Robert Edward Lee during an address before the Southern Historical Society in Atlanta, Georgia, on February 18, 1874, stated: "Lee] was a foe without hate; a friend without treachery; a soldier without cruelty; a victor without oppression, and a victim without murmuring. He was a public officer without vices; a private citizen without wrong; a neighbor without reproach; a Christian without hypocrisy, and a man without guile. He was a Caesar, without his ambition; Frederick, without his tyranny; Napoleon, without his selfishness, and Washington, without his reward." 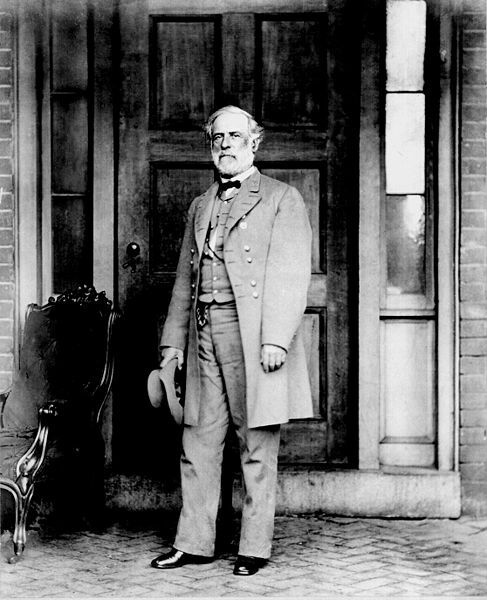 Robert E. Lee became the great Southern hero of the war, and his popularity grew in both the South and North, and it continued after his death in 1870. He remains an iconic figure of American military leadership. The Arlington National Cemetery in Arlington County, Virginia, is a military cemetery that was established during the American Civil War on the grounds of Arlington House, formerly the estate of Robert E. Lee. In 1900, Robert E. Lee was one of the first 29 individuals selected for the Hall of Fame for Great Americans (the first Hall of Fame in the United States), designed by Stanford White, on the Bronx, New York, campus of New York University, now a part of Bronx Community College. The USS Robert E. Lee was a submarine named for Lee, built in 1958. Recommended Reading: General Lee: A Biography of Robert E. Lee, by Fitzhugh Lee (Author), Gary W. Gallagher (Introduction). Description: A soldier, politician, and author, General Fitzhugh Lee (1835–1905) had attended West Point and proved to be a boisterous challenge to the superintendent of the Academy, who was also his uncle: Robert E. Lee. (Gen. Lee commended Fitzhugh as ”an excellent cavalry officer. . . . I feel at liberty to call upon him—on all occasions.”) The book covers Robert E. Lee’s early service in the Mexican War through his masterful command during the Seven Days Battle, Second Manassas, Sharpsburg, Fredericksburg, Chancellorsville, and the High Water Mark of the war--the Battle of Gettysburg. Fitzhugh vividly describes Lee's surrender and latter years. Continued below. About the Author: Rick Williams, active in historic and preservation societies, is a seventh-generation Virginian who maintains a busy writing and speaking schedule. He promotes the values and traditions of the Christian gentleman in books and literature of the eighteenth, nineteenth, and early twentieth century. This interest propelled his writing of the Maxims of Robert E. Lee for Young Gentlemen. Mr. Williams has served three four-year terms as a magistrate for the Commonwealth of Virginia and was a gubernatorial appointee of former Virginia governor, George Allen. He is a member of the Rockbridge County Historical Society, the Augusta County Historical Society, the Virginia Historical Society, the Highland County Historical Society, the Civil War Preservation Trust, the Museum of the Confederacy and currently serves as chaplain for the Stonewall Brigade Camp of the Lexington, Virginia, Sons of Confederate Veterans. Mr. Williams has served in various Christian ministries, including formerly working as a field representative for the Christian Law Association and serving as a Sunday school teacher for the past 25 years. He writes a regular column, "Business Lessons from History," for Business Reform Magazine and is a regular contributor to The Washington Times' Civil War Column. His articles have also appeared in Homeschooling Today Magazine and other Christian publications. He has lectured at Liberty University’s annual Civil War Seminar and at Lee Chapel in Lexington, Virginia. He is a member of the Bonnie Blue Literary Society, an organization that encourages historical research and publishing of Confederate history. He assisted constitutional attorney and law professor, John Eidsmoe, in producing the award-winning video series, Institute on the Constitution. Sources: General Officers of the Confederate States of America, Confederate Military History, National Archives; Blount, Roy, Jr. Robert E. Lee, Penguin Putnam, 2003; Carmichael, Peter S., ed. Audacity Personified: The Generalship of Robert E. Lee Louisiana State U. Pr., 2004; Connelly, Thomas L., "The Image and the General: Robert E. Lee in American Historiography." Civil War History 19 (March 1973); Connelly, Thomas L., The Marble Man. Robert E. Lee and His Image in American Society. New York: Alfred A. Knopf, 1977; Connelly, Thomas L., "Robert E. Lee and the Western Confederacy: A Criticism of Lee's Strategic Ability." Civil War History 15 (June 1969); Cooke, John E., "A Life of General Robert E. Lee" Kessinger Publishing, 2004; Dowdey, Clifford. Lee 1965; Dowdey, Clifford. and Louis H. Manarin, eds. The Wartime Papers of R. E. Lee. Boston: Little, Brown, 1961; Fellman, Michael (2000), The Making of Robert E. Lee. New York: Random House (ISBN 0-679-45650-3); Freeman, Douglas Southall. ed. Unpublished Letters of General Robert E. Lee, C.S.A., to Jefferson Davis and the War Department of the Confederate States of America, 1862-65. Rev. ed., with foreword by Grady McWhiney. 1957; Fishwick, Marshall W. Lee after the War 1963; Flood, Charles Bracelen. Lee — The Last Years 1981; Gary W. Gallagher; Lee the Soldier. University of Nebraska Press, 1996; Gary W. Gallagher; Lee & His Army in Confederate History. University of North Carolina Press, 2001; McCaslin, Richard B. Lee in the Shadow of Washington. Louisiana State University Press, 2001; Pryor, Elizabeth Brown; Reading the Man: A Portrait of Robert E. Lee Through His Private Letters. New York: Viking, 2007; Reid, Brian Holden. Robert E. Lee: Icon for a Nation, London: Weidenfeld & Nicolson, 2005; Taylor, Walter H. Four Years with General Lee Reprint. 1962; Taylor, Walter H. General Lee — His Campaigns in Virginia, 1861-1865. Reprint.1975; Thomas, Emory Robert E. Lee W.W. Norton & Co., 1995 (ISBN 0-393-03730-4) full-scale biography.